So you’re going to be a gay parent? Congratulations! No doubt you’ve been through a lot to get to this point, whether you’ve traveled the path of adoption, IVF, artificial insemination, surrogacy, fostering or whatever. Now, you have a lot to do to get ready. Don’t worry. This isn’t going to be one of those typical posts that tells you to stock up on diapers and learn CPR. 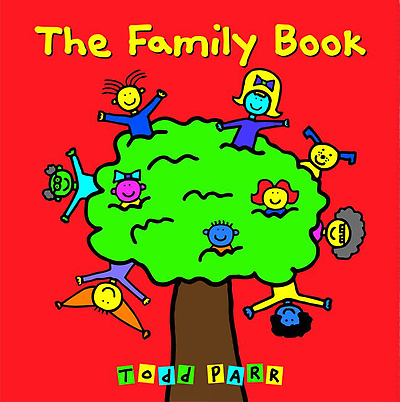 Most gay parents are overachievers on that front, I’d guess, since we’ve been planning our families for so long. I know I couldn’t wait to sign up for baby classes. I wanted to write this post specifically for you, though, the expectant gay parent, because there’s a whole lot of important parenting stuff they’re not going to cover in those baby classes that applies directly to you. There are some special things you’re going to experience because you have a non-traditional family, and I’ve encountered them, so I wanted to give you my tips on how to deal with them. 1. Your kids will need perspective. No matter where you live, it’s very likely that your kids will grow up feeling at least slightly out of the mainstream. They’ll see that most families have a mom and dad, and that their family is different. When they meet other kids, they probably feel that their friends are the ones who are missing out on something special by not having a family like ours. Yes, my kids are still young (3 1/2 as of right now), so they haven’t asked a ton of uncomfortable questions, and the Mommy issue hasn’t come up too much. But when that time comes (and I know it will), I’ll be able to talk about our family structure as something wonderful that makes us who we are, because that’s what I’ve been saying all along. Moms are great, too, but if we had one of those, we wouldn’t have two dads, and we wouldn’t be us. 2. You’ll constantly be outing yourself. Unless you’re always walking around in your rainbow-striped Pride t-shirt (and good for you if you are), you’re probably passing for straight most of the time, whether you mean to or not. As a childless person, this is not a big deal. You’re going to the supermarket to pick up a loaf of bread, not to discuss your private life with strangers, right? Even when my whole family is out together — me, the kids and my very obviously male partner — people find ways to force us into their preconceived notions of family structure. Then, the typical comment we get is, “I guess it’s Mom’s day off!” The assumption here is that my boyfriend and I are platonic buddies whose wives are off on a spa date or something. Hey, I take the spa dates in my family, thank you very much. But whenever I’m tempted to do that, I’ll remember two very good reasons I can’t… my kids. They love their dads very much, and I’ve been telling them constantly what an amazing and incredibly special family we have. What message would I be sending to them if I suddenly pretended our family was just like everyone else’s? That we need to lie about who we are? That they should lie? That I’m ashamed of being gay? That the opinion of some stranger in a supermarket is more important than the respect of my own children? Then I brace myself, because my real fear is that this person will turn out to be a member of the Westboro Baptist Church or the Boy Scouts senior leadership, and they’ll go all psycho fire and brimstone on me in front of the kids. Thankfully, that hasn’t happened yet. Sure, some people are taken aback, because like I said, all they wanted was polite chit-chat and now they feel forced to say… well, something. Usually, what they say is “I’m sorry. I shouldn’t have assumed,” because they’re embarrassed. In that case, I just smile, because that person is probably very nice and will never make that mistake again. Remember, your kids come before strangers. Don’t worry about what some lady at the supermarket thinks. And if you’re in a hurry to get someone to the potty or to pick Other Daddy up at the train station, just correct the lady at the Stop-n-Shop and keep on moving. She’ll figure it out eventually. Oh, and be prepared to do this with little kids, too. We sometimes get the question, “Where’s their Mommy?” and have to reply, “They don’t have one. They have two dads.” It usually ends there… for us, at least. If the questions get any trickier, we can always fall back on, “Go ask your parents.” Not my kids, not my problem. 3. You will now be an activist for non-traditional families. As a childless LGBT person, it’s entirely possible to live your life in a supportive bubble. Move to San Francisco or LA. Work for GLAAD. Join a gay softball league. Surround yourself with people who know you and accept you. I’d guess many of us spent the years after coming out doing just that. Well, if you’re going to have kids, you’re going to have to venture outside your gay-friendly bubble. Constantly. Your kids will be going to school and playing Little League primarily with kids from mom-and-dad-headed families, and you’ll be interacting with people who won’t always be 100% on board with the whole gay thing. Even going to IHOP on Family Night can feel like you’re Making a Statement, because some people will figure out immediately exactly what your family is all about. Hi, welcome to the cause. What’s that? You’re not a political person? Well, good, because this isn’t about politics. It’s about your family, and being a good parent means doing what’s best for your kids. You want them to grow up in a better world than you did? Great, then get ready to fight for them. The good news is that most of the time, you can do this by pushing back gently. When I filled out my kids’ preschool applications last year, the forms had spaces for “Mother’s Name” and “Father’s Name”. I could’ve just written our names in those spaces. I guess I also could’ve called up and complained or raised a stink. Instead, I simply crossed out “Mother” and wrote “Father #2″, then submitted the forms as normal. Why assume that the school was homophobic? It was far more likely that they just hadn’t had any gay parents there before (or any who cared about the forms), so the forms had never been an issue. You know what? When I filled out their applications the next year, the forms had been updated. There were now two lines labeled “Parent Name”. A subtle change other parents are unlikely to notice, but that meant a lot to me. Best of all, I didn’t have to be someone’s pain in the neck to accomplish it. But you can’t be silent. You don’t want your kids to get to school and have the teacher asking them about their “Mommy” or “Daddy” (or whichever parent your family doesn’t include). You never know when a clueless teacher might insist, “Oh no, you have to have a Mommy. Everyone does!” So don’t make your kids do the hard work. 4. People will generally be very nice to you (at least to your face, and that’s all that matters). 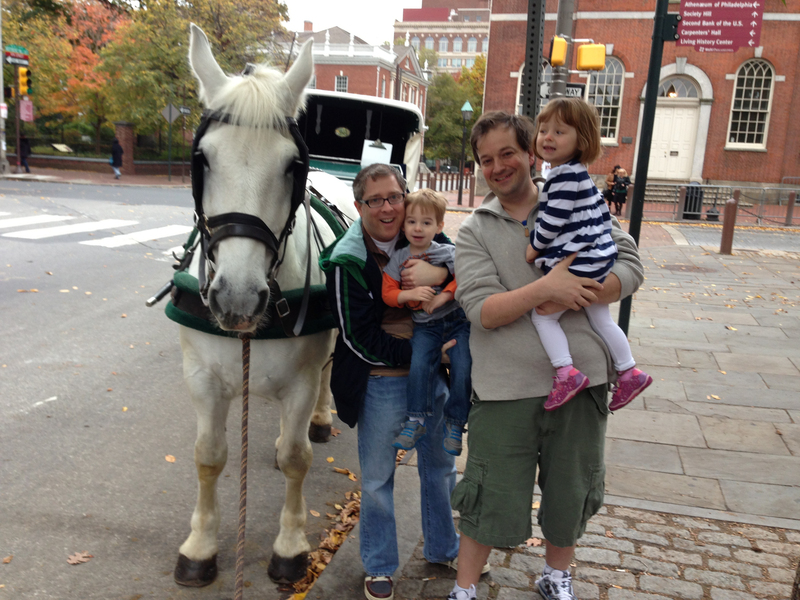 Before I had kids, I assumed I’d meet a lot of resistance from the anti-gay crowd as a dad. I worried that preschools might turn us away, that other parents would refuse to set up playdates with my kids, that we’d get sneered at or harangued in public. What can I say? I was stung pretty hard when Prop 8 passed, and I took it very personally. I may even have had a tiny bit of a chip on my shoulder. But here’s the good news. While I’m sure some of that ugly homophobia is out there, I have yet to face it head-on. I wrote a piece for this blog a while back called “The 5 People You Meet as a Gay Dad“, wherein I discussed the reactions I’ve received from people who’ve met my family. And I admitted at the end that the worst thing I’ve dealt with is polite discomfort. 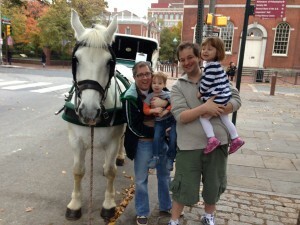 That piece generated a ton of comments, and almost all the other LGBT parents who wrote in had similar experiences. Even those who lived in much more conservative areas had been pleasantly surprised at the support they’d received. So you can feel good about your decision to have a family in this world at this time. I’m constantly touched and encouraged by how accepting and friendly most people are towards us. They want to learn our story, or to tell me about other gay parents they know. I constantly hear things like, “My sister and her wife are trying to have a baby. I’m so excited for them!” Sometimes they treat us like celebrities, like the nurse when my son was in the hospital. She told us she’d always wanted to meet gay dads, and she jogged around the kid’s hospital bed to give us hugs. So my ultimate advice is the same thing you probably figured out when you first started coming out: be yourself and be proud. Assume the best of people, and very often, that’s what you’ll get. Now go read those other parenting books and learn about feeding, diapering, swaddling, bathing and all that. 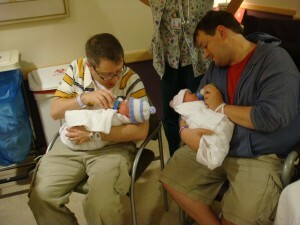 Being a parent, gay or straight, is the most amazing, rewarding and totally freaking difficult thing you’ll ever do. You’ve got a lot to learn.